INTI International College Penang student Lim Oon Feng has been accepted for studies at the University of Central Oklahoma (UCO), which stands out among Oklahoma universities as a top producer of Fulbright scholars in the United States. Oon Feng was also awarded the UCO Global Scholarship worth USD3,000 per annum during a recent visit to the campus by UCO’s Director of International Admissions and Communications, Timothy Kok. “We recognize INTI’s American Degree Transfer Program as among the best in the world and warmly welcome students from INTI’s campuses,” said Kok, who represents one of INTI’s earliest education partners in the United States and whose illustrious alumni include Datuk Desmond Lim Siew Choon, the Chairman of Pavilion REIT. 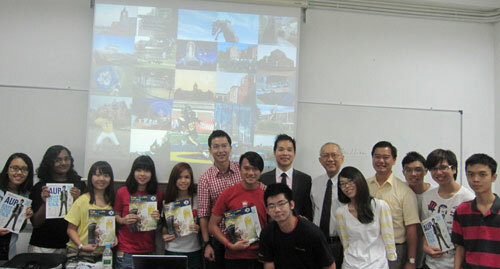 Oon Feng (7th from left) and fellow students with Timothy Kok (in suit) and members of INTI’s management and faculty. Oon Feng is an all-round student who is strong in academics as well as active in a range of student events and sports. Majoring in Finance in the American Degree Transfer Program (AUP), he requires only two more years of studies to complete his bachelor’s degree at UCO. “I want to thank INTI for bringing out the best in me through the many opportunities for students to learn and excel within and beyond the classroom. It is a privilege to be able to complete my studies at a renowned university such as UCO and to be awarded a scholarship which will certainly lighten my financial burden,” said the delighted Oon Feng. INTI’s extensive list of colleges and universities in the US for credit transfer and its track record of sending the most number of students to America for higher education means that its AUP is the most popular programme of its kind in Malaysia. More than 300 US and Canadian universities and several universities in Australia accept credits earned through INTI’s AUP. University options available to students include Ivy League universities such as Cornell University, University of Pennsylvania and Brown University where INTI students have successfully pursued studies in the Sciences, Social Science and Actuarial Science. Students of INTI benefit not only from the over 25 years of experience and strong track record that INTI offers, but also gain from the global synergy and resources that Laureate International Universities provides. INTI is part of Laureate International Universities, the world’s largest private education network with a presence in 29 countries, with more than 60 accredited campus-based and online universities and 130 campuses, serving over 740,000 students globally. For further information on INTI’s American University Program, please call 04-6310138.